Classical music: Trevor Stephenson talks about the Baroque concertos that the Madison Bach Musicians will perform this Saturday night and Sunday afternoon. ALERT: The Ear apologizes for mistakenly listing this item last week: The weekly FREE Friday Noon Musicales at the historic First Unitarian Society of Madison, designed by Frank Lloyd Wright and located at 900 University Bay Drive, begin the new season this week. This coming Friday, Oct. 2, at 12:15-1 p.m. in the Landmark Auditorium, mezzo-soprano Consuelo Sanuda and pianist-composer Jeff Gibbens will perform songs by Gustav Mahler, Gabriel Faure, Manuel de Falla and Jeff Gibbens. The Madison Bach Musicians (below) is thrilled to start its 12th season this weekend with an entire program of baroque concertos for strings. I will be discussing the program today on Wisconsin Public Radio’s The Midday program with host Norman Gilliland from noon to 12:30 p.m. There will be two performances: this coming Saturday night at 8 p.m. at Immanuel Lutheran Church (below), 1021 Spaight Street, on the near east side; and Sunday afternoon at 3:30 p.m. at Holy Wisdom Monastery on the far west side at 4200 County M in Middleton. I’ll give pre-concert lectures at both events at 7:15 p.m. and 2:45 p.m., respectively. Our soloists will be MBM concertmaster Kangwon Kim (below top) and internationally renowned baroque cellist Steuart Pincombe (below bottom). 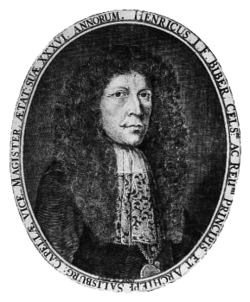 Right out of the gate, we’ll dive into a programmatic 17th-century masterpiece, Battalia (Battle, heard played by the renowned Jordi Savall and Le Concert des Nations in a YouTube video at the bottom) , by Heinrich Biber (below). 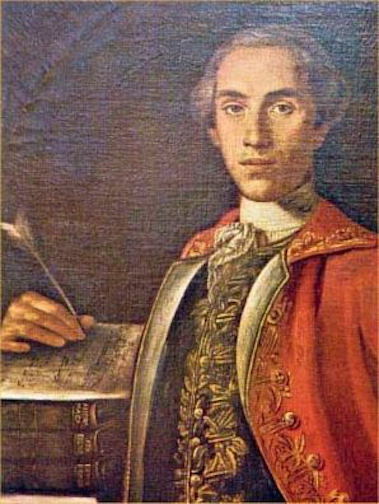 Composed around 1673, Battalia’s sequence of epigrams outlines a timeless narrative: from the drunken good humor and singing of disparate songs in several keys at once (long, long before Charles Ives) in the soldiers’ camp, to the sabre rattling of Mars, to the love song (aria) before the battle, to the battle itself, to the lament of the wounded musketeers (the slow descending chromaticism must be the oozing of wounds). Biber’s sense of just how far to take each scene is what makes the work memorable. His instinct here is unerring in knowing how many repetitions to give a motive before finally closing it with a cadence — Scarlatti and Stravinsky are later masters of this technique. After Biber, we’ll move on to the elegant and rightly famous Violin Concerto in A minor by Johann Sebastian Bach (below). Bach learned an immense amount about ritornello form from his careful study of Antonio Vivaldi, whose music we’ll hear from at the end of the program. 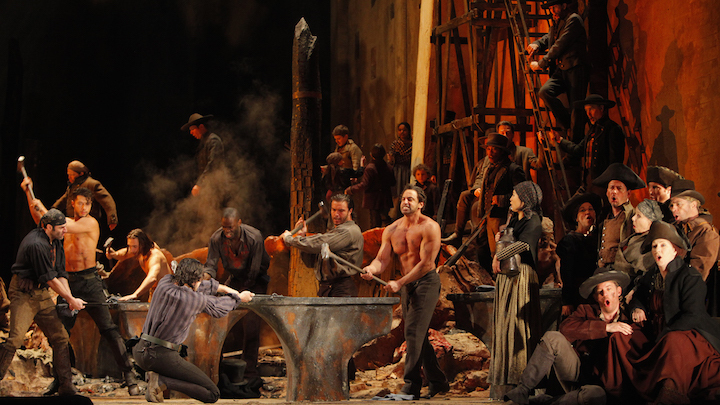 In ritornello structure, the band and the soloist trade off sections; the band’s sections are full and fleshed out, more like a crowd or a Greek chorus, the soloist’s material is usually more intricate and virtuosic. But the soloist and the band are only minimally contrasted in baroque style, since usually the band backs up the soloist and in many performance approaches the soloist will also play along during the band’s louder sections; the feeling is very convivial. I’m always amazed by how much Bach’s music is at once thoroughly inspired by Italian music — with its leaps, drive and energy — and yet is never overrun with Italianisms. Take the opening ritornello of this violin concerto. The first four measures could come from almost any Italian master, and then Bach brilliantly extends and twists and cantilevers the cadence for another 20 measures to set the stage for the soloist’s refined entrance in the upbeats to measure 25. The Andante middle movement has a compelling, heartbeat-like rhythmic underpinning (regularly punctuated by a swaying figure) in the opening ritornello, which then gives way to the solo violin’s utmost tenderness and rhetorical conviction. The finale is a propulsive gigue in the somewhat unusual meter of 9/8. The piece on our program that very few in the audience will have heard before is the Cello Concerto in A major by Leonardo Leo (below). 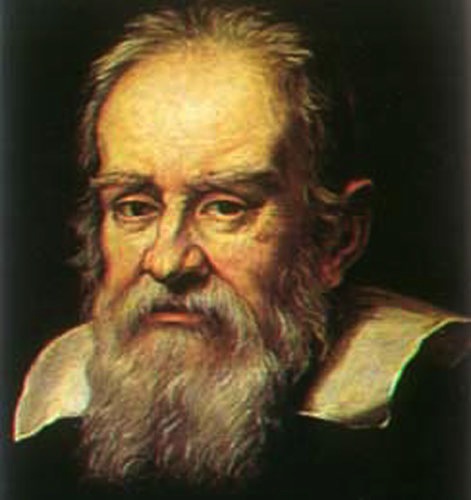 Leo was born near the end of the 17th century in Naples, where he worked for much of his career, writing primarily both comic and serious operas. His cello concertos date from around the mid-1730s and are characterized by transparency of texture and form that in some ways make them precursors to the coming neo-classical style of the later 18th-century. It is not certain that he played the cello, but the writing in the concertos is idiomatic, colorful and virtuosic. 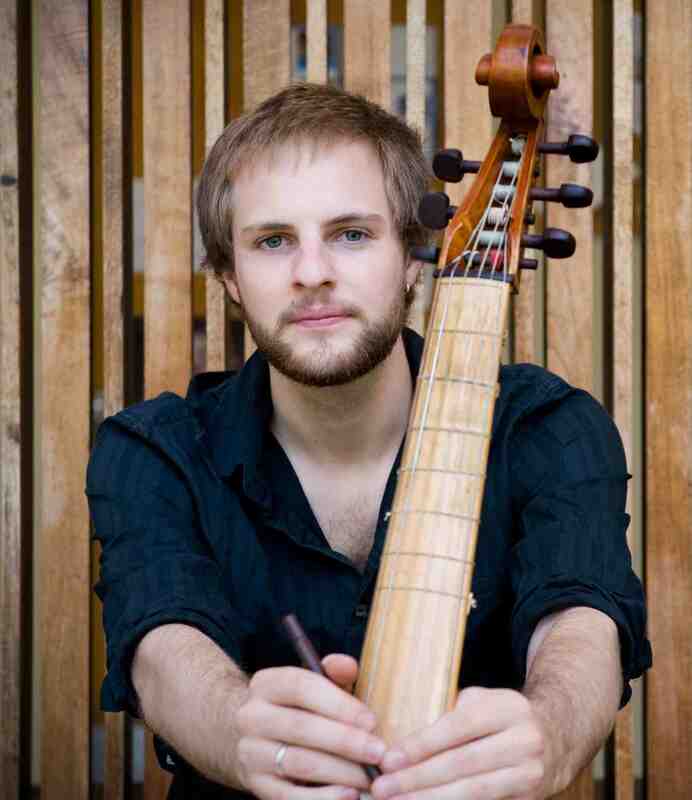 MBM is delighted that guest cellist Steuart Pincombe has brought this work forward for these concerts. The final work is Vivaldi’s Double Concerto for Violin and Cello in B-flat major, RV 547. 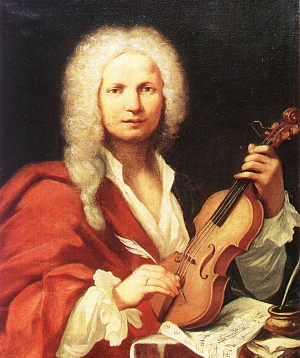 Vivaldi (below), nicknamed the “Red Priest” because of his magnificent mane of red hair, was of course a spectacularly gifted violinist who wrote hundreds of compositions for that instrument. But he also teamed the violin with the cello on several occasions. I’m always awed by Vivaldi’s consistently successful use of irregular phrase lengths. The music just seems to roll on out there and be perfectly balanced, but the measure groupings are often in fives or sevens, and not so much in the four-measure groupings that typically connote stability. A few other composers have mastered this technique of hiding wonderfully asymmetrical structures, and J. S. Bach is most notable. 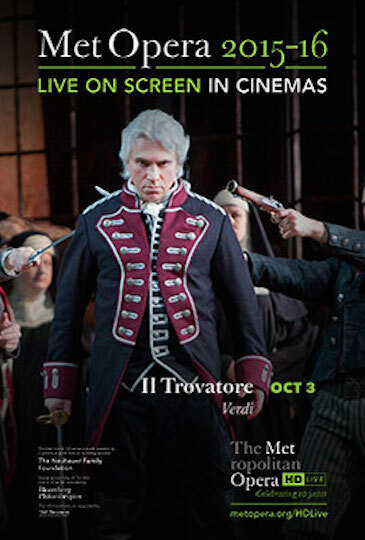 The entire concert will be played on period instruments: gut strings and baroque bows. 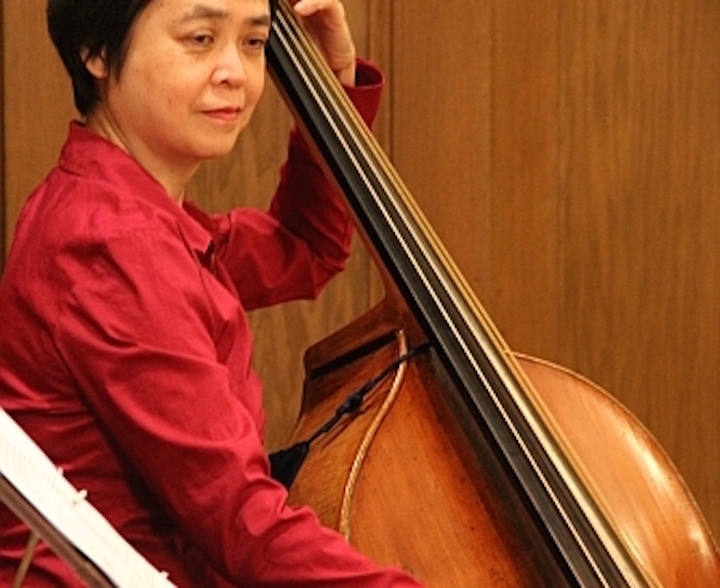 We’re also delighted to welcome to this concert the specialist on the violone (baroque double bass) Marilyn Fung(below) from Michigan. 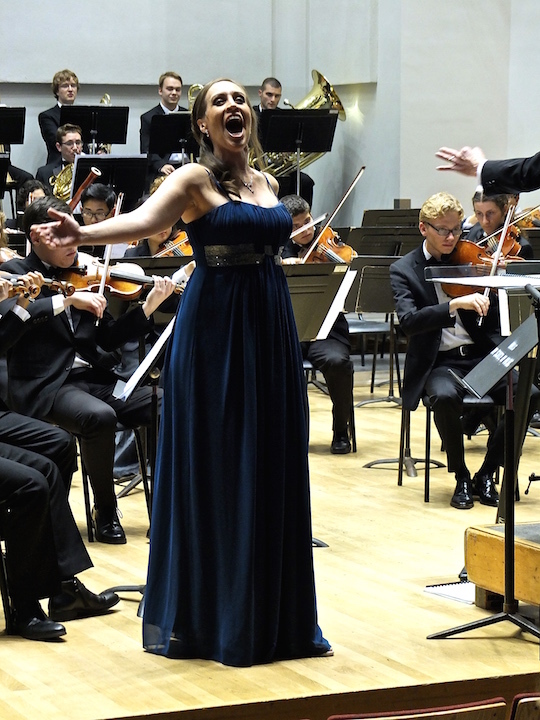 Classical music: UW alumna and opera diva Brenda Rae returns to wow the crowd with her virtuosic singing while the UW Symphony Orchestra puts its strengths on display. 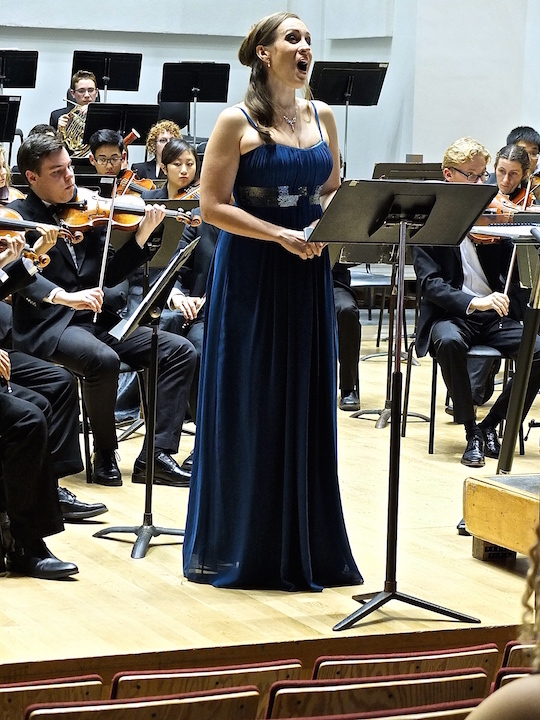 The concert by the UW Symphony Orchestra on Sunday evening night was hyped largely for the appearance of the brilliant young soprano Brenda Rae (née Kinkert in Appleton, Wisconsin). An undergraduate in the UW-Madison School of Music, and participant in University Opera productions a few years back, she has since moved on, through the Juilliard School, to a burgeoning career in German opera houses. This concert was the climax of her weekend return here to help promote the funding of the UW voice and opera program. To her considerable credit, she chose as her scheduled vehicle Reinhold Gliere’s Concerto for Coloratura Soprano and Orchestra, a rarely heard work that is quite fascinating. Gliere uses the solo part in instrumental terms, as a vocalise, without words. The work might be described as a concerto for vowels and orchestra. It is meant to explore the sheer sound of the soprano voice, in all its possible colors. 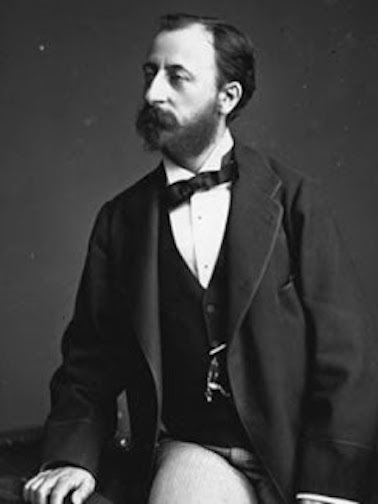 The soloist (below) is heard in the slow first movement blending into a handsomely melodious Late Romantic orchestral sound, while the second movement tests a coloratura’s virtuosity in suggesting meaning through inflection rather than words. Brenda Rae (below) sang it as a true diva, to tonal and dramatic perfection. But it also served to point up the kind of operatic style that Gliere was suggesting, and affectionately spoofing, in his concerto. There was far more than just vocal display to this concert, however. The opening item was no less than Claude Debussy’s challenging tone poem La Mer. The work calls for both skilled playing and artful leadership. Conductor James Smith gave another demonstration of his capacity to draw wonders from his student players — unfolding and blending the kaleidoscope of instrumental colors that Debussy manipulates variously in each of the three movements. Though some of the audience (mostly students, I think) walked out at the intermission — more interested in performers than in music, I fear — the bulk of the audience that remained was treated to another of maestro Smith’s wonders, if not miracles. Sergei Rachmaninoff’s Symphonic Dances, his last completed work, is a fiercely difficult and draining affair. 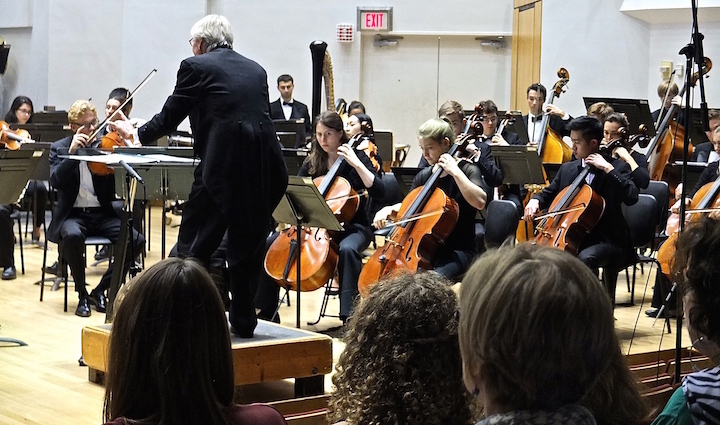 Here we have “Madison’s third orchestra” – the Madison Symphony Orchestra and the Wisconsin Chamber Orchestra being the other two — making a blazing trail of its own in the direct wake this past weekend of the MSO’s own magnificent September concerts. Oh, how blessed musically is Madison for those who take the trouble to benefit from it all! 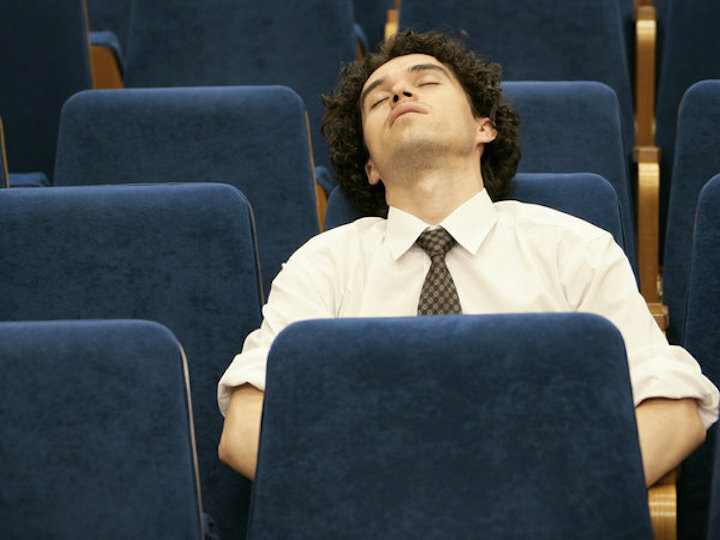 Classical music: Why are most artist bios and program notes such snoozers? Dear Friends: The Madison Bach Musicians begins its 12th season next weekend on Saturday night (8 p.m. at Immanuel Lutheran Church on the near east side) and Sunday afternoon (3:30 p.m., at Holy Wisdom Monastery on the far west side on County M) with a marvelous program of four Baroque concertos by Johann Sebastian Bach, Heinrich Biber, Leonardo Leo and Antonio Vivaldi! 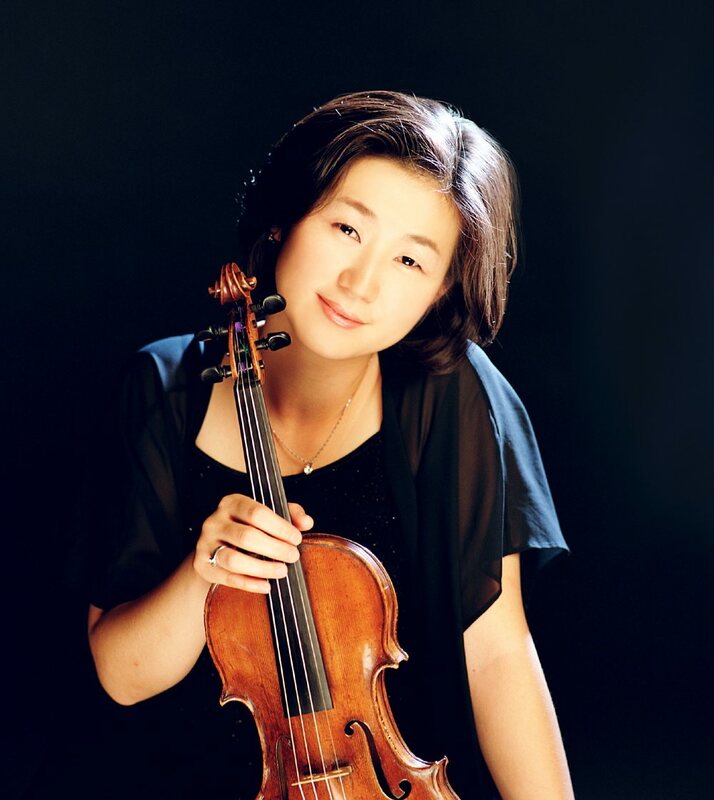 Soloists will be MBM concertmaster violinist Kangwon Kim, and guest artist Steuart Pincombe baroque cellist. I’ll give pre-concert lectures at both events (at 7:15 p.m. and 2:45 p.m., respectively). I’ll be discussing these upcoming concerts on two radio programs here in the next couple of days. This Sunday morning, Sept. 27, from 10:30 to 11 a.m. on WORT FM radio (89.9), I’ll be Alan Muirhead’s guest on the Musica Antiqua program. On Wednesday, Sept. 30, Kangwon Kim, Steuart Pincombe and I will all be Norman Gilliland’s guests on the Midday program noon-12:30 p.m. on Wisconsin Public Radio (88.7 FM). I hope you can tune in. Tickets are available online at (www.madisonbachmusicians.org), at our ticket outlets, and at the door. I look forward to seeing you at the concerts!! The new concert season is here. That means many of us will spend too many minutes reading second-rate program notes and inferior artist biographies as we wait for a concert to take place — even though I think many local groups and local program note writers do quite well. That is the question raised by reporter and critic Anastasia Tsioulcas (below) for the Deceptive Cadence blog on National Public Radio or NPR. It’s a good piece and raises a lot of questions as well as provides some suggestions. It has been long overdue. Leave your own reactions, criticism and suggestions about program notes and artist bios in the COMMENTS area. 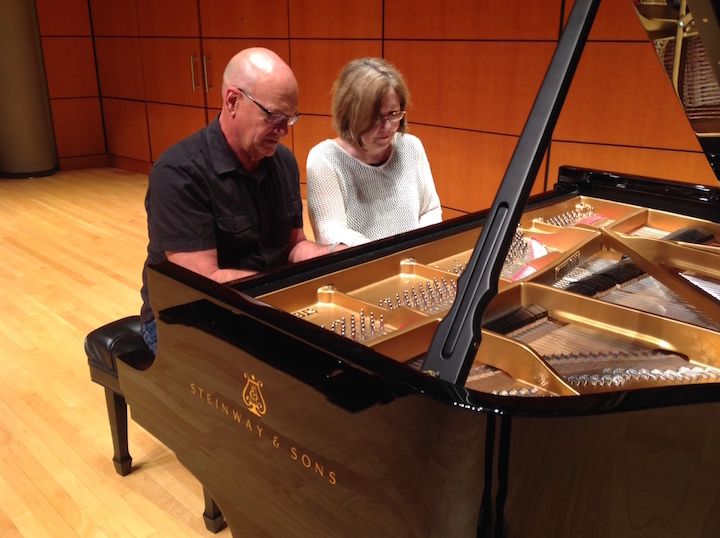 Classical music: Michael Keller and Martha Thomas will perform a FREE recital of music for piano-four hands this Sunday afternoon. On this coming Sunday, Sept. 27, at 3 p.m. pianists Michael Keller and Martha Thomas (below) will be presenting a FREE piano, four-hand program at Christ Presbyterian Church, 944 East Gorham Street, in downtown Madison. Martha Thomas is faculty member of the University of Georgia Hodgson School of Music. 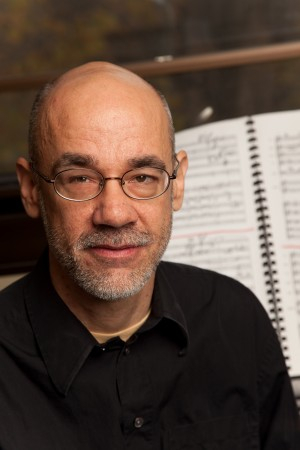 Michael Keller is a retired professor of piano at the University of Wisconsin-Stevens Point who is now based in Madison. Both pianists were students of the late Howard Karp at the UW-Madison School of Music. When they reunited at his memorial last fall, they planned this program. 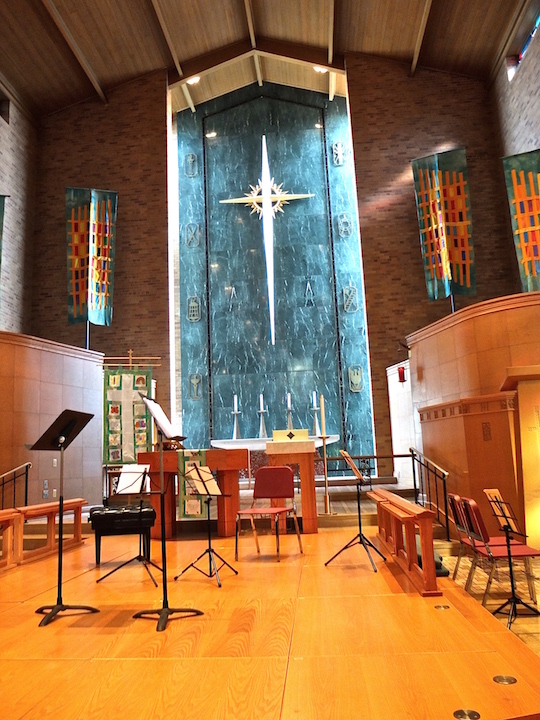 Classical music: Unitarian Society’s FREE Friday Noon Musicales start a new season this week. 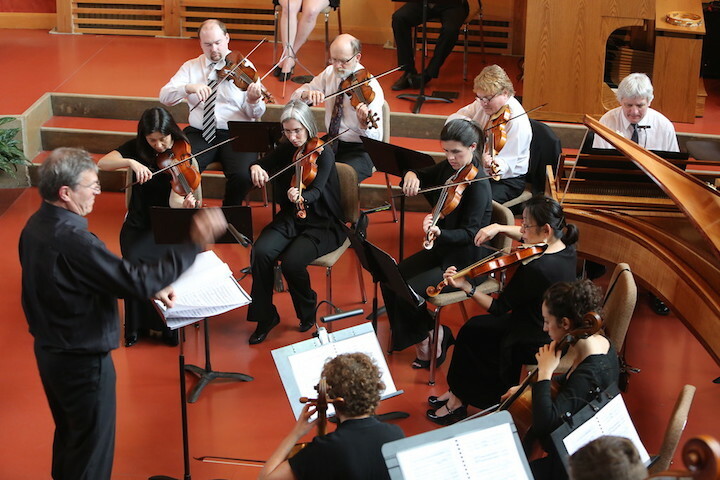 And the Edgewood Chamber Orchestra opens its new season with music by Handel, Haydn, Beethoven and Saint-Saens, this coming Sunday afternoon. ALERT: The weekly FREE Friday Noon Musicales at the historic First Unitarian Society of Madison, designed by Frank Lloyd Wright and located at 900 University Bay Drive, begin the new season this week. This coming Friday at 12:15-1 p.m. in the Landmark Auditorium, mezzo-soprano Consuelo Sanuda and pianist Jeff Gibbens will perform songs by Gustav Mahler, Gabriel Faure, Manuel de Falla and Jeff Gibbens. 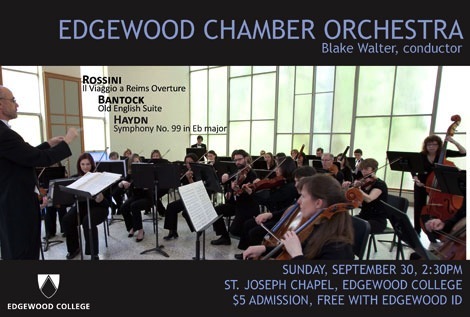 The Edgewood Chamber Orchestra (below, in a poster from 2012) will open its new season this coming Sunday afternoon. Under the direction of conductor Blake Walter (below), the orchestra will perform works by Beethoven, Haydn, Handel and Saint-Saens on Sunday, Sept. 27, at 2:30 p.m. in the St. Joseph Chapel, 1000 Edgewood College Drive. Admission is $5 to benefit music scholarships, or free with an Edgewood College ID. 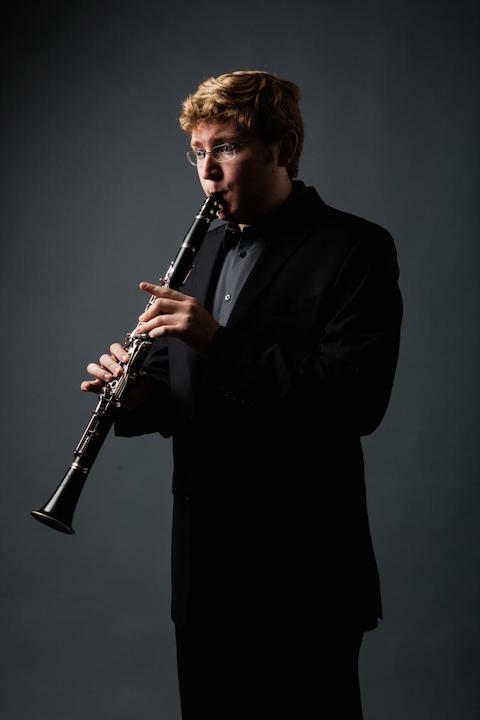 Classical music: Meet Joseph Morris, principal clarinet of the Madison Symphony Orchestra. 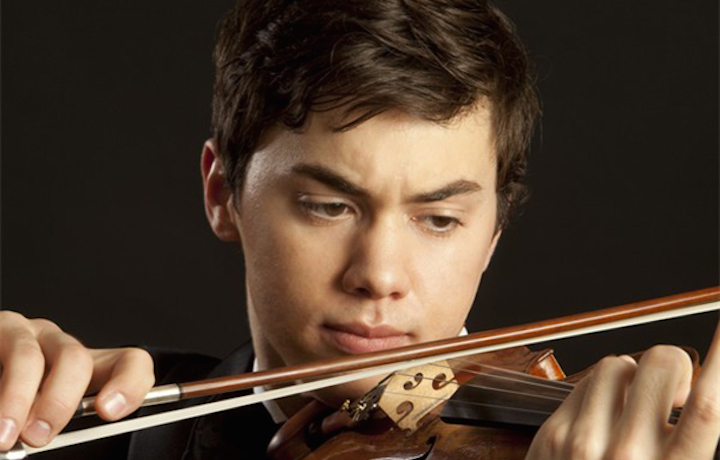 He solos in a concerto by Aaron Copland this weekend. Conductor John DeMain and the Madison Symphony Orchestra (MSO) will open the MSO’s 90th season this coming weekend. The program includes the “Leonore” Overture No. 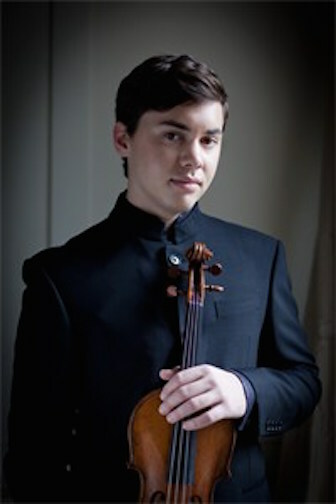 3 by Ludwig van Beethoven; the Clarinet Concerto by Aaron Copland with MSO principal clarinet Joseph Morris (below, in a photo by Cheryl Savan) as soloist; and the Symphony No. 4 by Peter Ilyich Tchaikovsky. 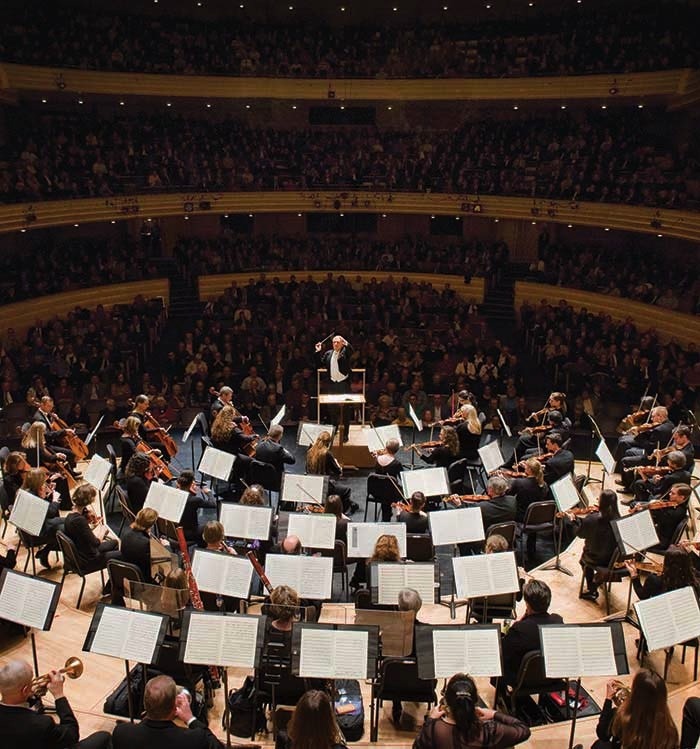 The concerts in Overture Hall in the Overture Center, 201 State St., are Friday at 7:30 p.m.; Saturday at 8 p.m.; and Sunday at 2:30 p.m.
One hour before each performance, Michael Allsen, UW-Whitewater Professor of Music, MSO Trombonist & MSO program notes annotator, will lead a 30-minute Prelude Discussion in Overture Hall to enhance concertgoers’ understanding and listening experience. Single Tickets, $16 to $85 each, can be purchased at www.madisonsymphony.org/singletickets, through the Overture Center Box Office at 201 State Street, or by calling the Box Office at (608) 258-4141. Groups of 15 or more can save 25 percent by calling the MSO office at (608) 257-3734. Find more information at http://www.madisonsymphony.org. Could you briefly introduce yourself to readers and give some highlights of your education and career? I grew up in Northern California before heading to Los Angeles where I did my undergraduate degree in Clarinet Performance at the University of Southern California Thornton School of Music. It was there that I began my studies with Yehuda Gilad (below), who has been, by far, the highlight of my musical education. After graduating I continued my studies at the Colburn Conservatory of Music, where I received a Professional Studies Certificate in 2014. 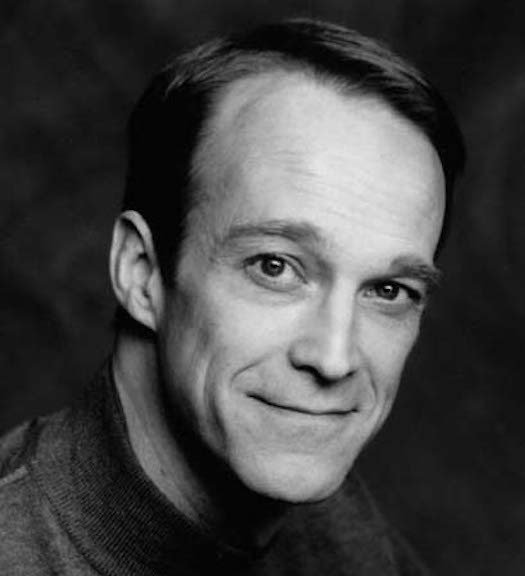 Some highlights of my education included summers at the Aspen Music Festival, the National Repertory Orchestra and two summers at the Music Academy of the West studying with Richie Hawley. I won the MSO’s Principal Clarinet audition out of 44 applicants in 2013 when I was 22 and still studying at Colburn. 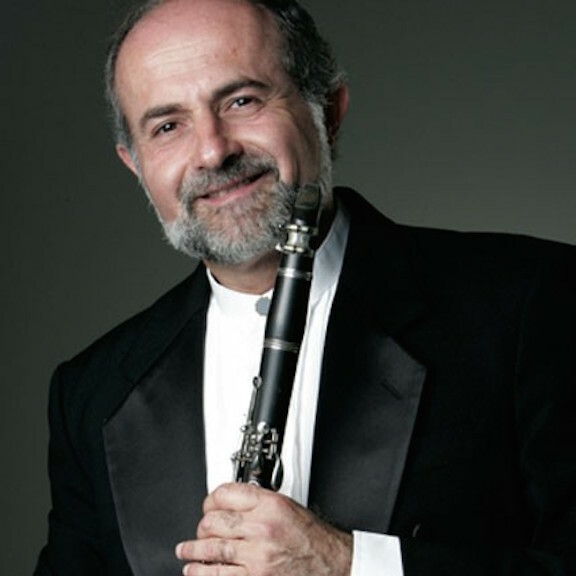 This past winter, I joined the Sarasota Opera Orchestra in Florida as their Principal Clarinetist and I have spent the past two summers at the Clarinet Faculty at the Luzerne Music Center in the Adirondack region of New York. Other highlights of the last few years have been returning to Colburn to perform John Adams’ Gnarly Buttons for solo clarinet and chamber orchestra with Mr. Adams conducting, and competing in the fifth Carl Nielsen International Clarinet Competition in Odense, Denmark. 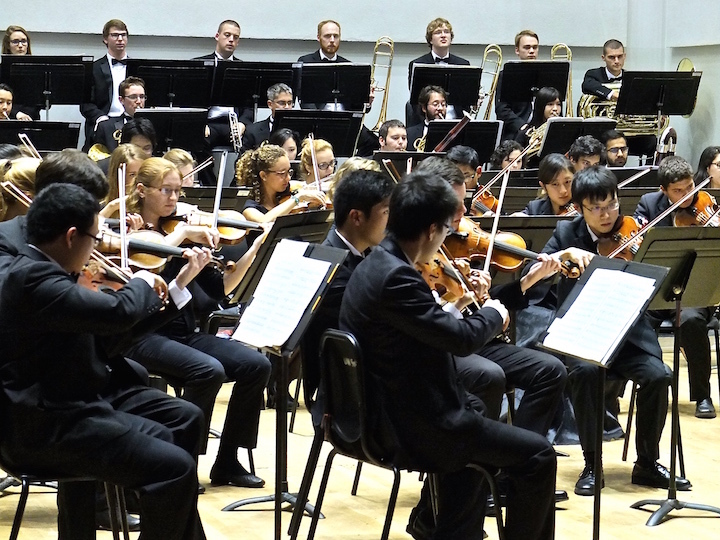 How have your years in Madison with the MSO been? I have enjoyed the past two seasons in Madison very much! Madison is a wonderful city and it has been very fun to get to explore all that it has to offer. I love the sense of community in Madison and especially how that extends to the MSO (below). My colleagues in the orchestra are fantastic players as well as wonderful people. Everyone brings out the best in one another throughout the rehearsal and performance process. It has also been a huge honor to receive the support of the MSO audiences who never cease to amaze me with their knowledge and enthusiasm for what we do on stage. What was your Aha! moment –- perhaps a performer or a specific performance or a piece of music — when you first knew you wanted to be a professional musician? When I was 15, I spent a summer at the Interlochen Arts Camp (below) in Michigan. After a summer of intense study, I realized that I had to pursue music as a career. More than anything it was the shared experience with my peers, who felt the same intensity for music that I did, that brought me to that conclusion. At the end of every summer at Interlochen the entire camp performs Franz Liszt’s Les Preludes together in an enormous musical collaboration. That specific performance will always remain in my memory as something that laid the foundation for my decision to go into music. How do you compare the Copland Concerto to other well-known clarinet concertos by Wolfgang Amadeus Mozart, Carl Nielsen and Gerald Finzi (which you performed with the Middleton Community Orchestra). 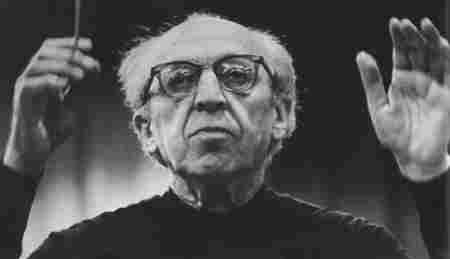 And what would you like listeners to know about the Copland Clarinet Concerto in terms of its structure, technical difficulties, melodies and harmonies, whatever? One thing that always interests me about works for the clarinet is whom the composer had in mind when they wrote it. 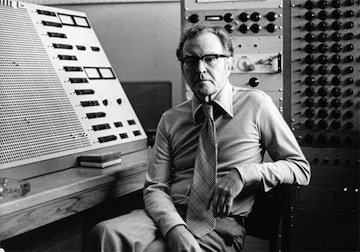 For Mozart, that was Anton Stadler; for Nielsen, it was Aage Oxenvad; for Johannes Brahms, it was Richard Muhlfeld; and for Copland, it was Benny Goodman. 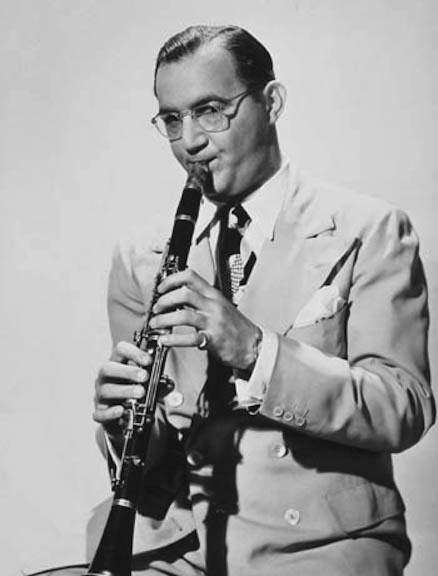 And Benny Goodman’s style, especially as a big band jazz musician, is extremely apparent in this concerto. It opens with a first movement that is more typically Copland (below top) than Goodman (below bottom) — with huge interval leaps in the solo line over truly gorgeous string writing. It reminds me of the opening passage of his “Appalachian Spring,” which, coincidentally, was the first piece I ever performed with the MSO. Following the lyrical “first movement” is an extended cadenza where Goodman starts to take over as the piece morphs into something much more lively and jazz based. After the cadenza the orchestra comes back in for a sort of “second movement” that eventually comes to a very frenzied and glissando-laden finish. Apart from concertos and chamber music specifically written for the clarinet, what orchestral works have your favorite clarinet parts? I love the way the clarinet timbre can emerge from the orchestra with a sort of floating quality in a lyrical passage. For that reason two of my favorite orchestral works for the clarinet are Sergei Rachmaninoff’s Symphony No. 2 and Ottorino Respighi’s “Pines of Rome,” which the Madison Symphony Orchestra (below) will perform at its April 29-May 1 concerts. I’m very excited for this upcoming concerto both because of the opportunity to perform this concerto with my marvelous colleagues, and also to then get to sit in the orchestra with them all for Tchaikovsky’s Symphony No. 4. Classical music: The Ancora String Quartet welcomes back first violinist Leanne Kelso League and turns in an outstanding performance of an unusual program to kick off its new season. 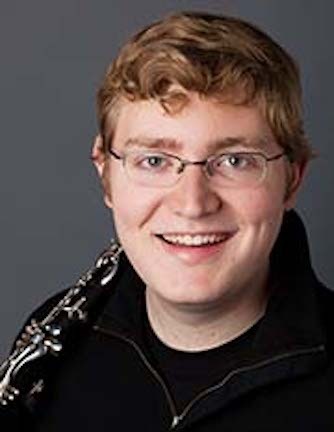 EDITOR’S NOTE: Due to a technical glitch, a post about the Madison Symphony Orchestra principal clarinet Joseph Morris was mistakenly released earlier today. It was and is scheduled to appear tomorrow, getting posted tonight at midnight. The Ear regrets the mistake and any inconvenience. 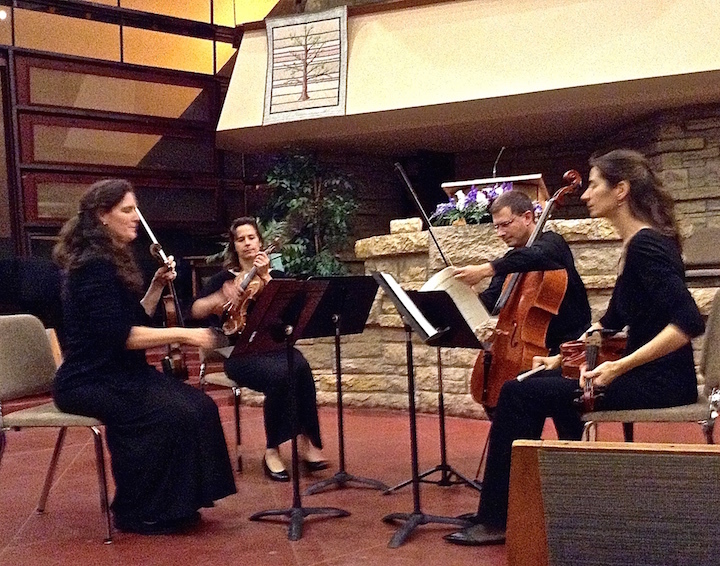 The Ancora String Quartet opened its new season at the First Unitarian Society of Madison on Saturday night. An immediate feature of the event was the return of Leanne Kelso League as the group’s first violinist. Her absence on sabbatical for the past two seasons has prompted some experimentation, last season with two different guest first violinists. Each was individual, and brought individual new qualities with each shift. But it was good to have League back again, bringing her powerful and incisive qualities of playing and leadership once more to the group. The program was an interesting venture in relative novelties. 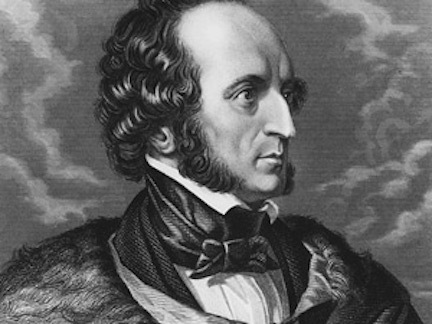 The opening work was the penultimate string quartet by Felix Mendelssohn (below), his Op. 44, No. 3. Mendelssohn’s chamber works, especially his quartets, are often kept in the shadows; but they deserve attention, especially this one. In E-flat major, it offers first two movements marked by stormy assertiveness. The third movement is a thing of warm beauty and slightly sad nostalgia, while the final movement seemed to establish a balance between the contrasting moods of what preceded. The performance was superb, certainly belying the idea many have that Mendelssohn was just a lightweight composer. This is powerful music. That the Ancora performance was so strong and passionately articulated certainly owed a lot to League’s renewed participation. 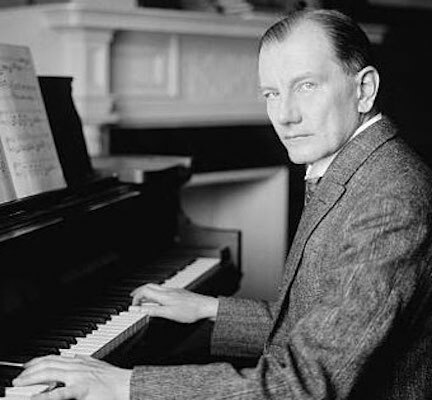 The surprise of the program, though, was the second of the three quartets by Ernst von Dohnanyi (1877-1960, below). The chamber music by this Late Romantic or Post-Romantic Hungarian master is not often performed and recorded, but the Ancora performance made it clear it should be heard more often. The members of the Ancora — who also play with the Madison Symphony Orchestra and the Wisconsin Chamber Orchestra — gave it a superbly committed, convincing rendition. More, please! 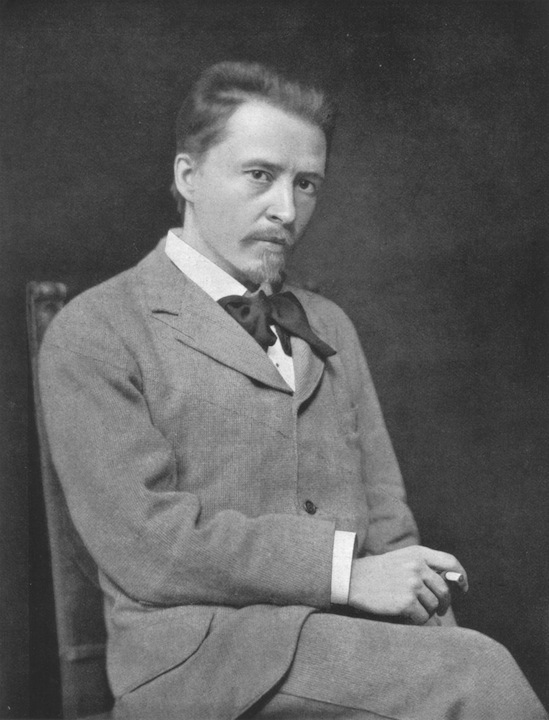 Finally, the quartet played one of the few chamber works by the Viennese Hugo Wolf (1860-1903, below in 1902), famous for his German Lieder or art songs. The Italian Serenade is certainly his most recurrent concert work, a piece of durable froth that is always a pleasure to hear, and provides an upbeat way to end a program. 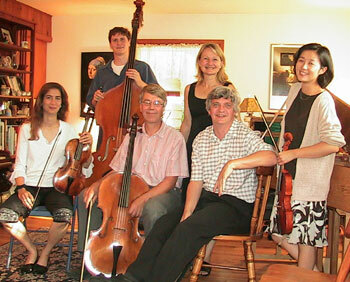 The Ancora String Quartet is scheduled to return on May 21.